Dan Gonzalez is the brainiac behind the New Evangelizers logo for the apostolate my wife and I started and Jennifer still runs. He helped design the current look and feel of Rosary Army, That Catholic Show, The Catholics Next Door and all the other ministries operating out of our basement. He’s amazing. I’ve offered him a job, but he doesn’t want to leave Miami. Can’t really blame him. 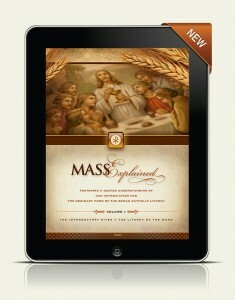 He recently developed and launched an amazing iPad app called Mass Explained. It’s one of the most gorgeous apps I’ve ever seen. Again, I offered him a job for a reason. We met Dan in person a few years ago when my wife and I were speaking at the Eucharistic Congress in Atlanta (I’ll be speaking there again in June, by the way). Dan had a booth next to ours for his Agnus Gift Shop t-shirt company. Now, you’ve got to understand something about t-shirts at the Eucharistic Congress. The first year we went to the Congress was in 2003 and we had our own booth for our Rosary Army apostolate. 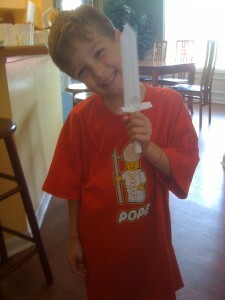 Despite being a relatively new ministry, we sold Rosary Army t-shirts (and people loved them). In subsequent years, as the Congress swelled to 30,000 attendees annually, we sold shirts in different colors but with the same design, and each year people bought them. But over time, more and more t-shirt companies popped up in the exhibitor’s area until the market was over-saturated and we quit selling our shirts. Even worse, all the Catholic shirts looked the same. And then we met Dan in 2009 and were blown away by his creativity and the incredible designs of his shirts that he created all by himself. His booth was providentially located right next to the Rosary Army table and he generously gave all of our kids shirts with a LEGO Pope image he created. They absolutely loved them and in the past 5 years have pretty much worn them out. Again…did I mention I keep offering the guy a job? 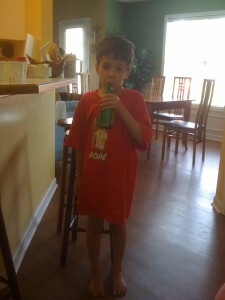 Well, again, this was 2009 when he gave us those shirts, and one kid in our family was barely out of the womb. So imagine our surprise when last week a box showed up at our door and it was packed to the rim not only with new LEGO Pope shirts for the boys who have considerably grown over the years, but it also had shirts with Dan’s brand new design based on the coat of arms of Pope Francis. 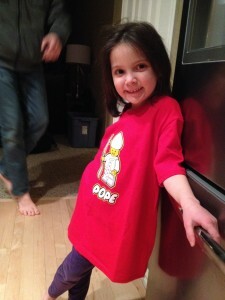 And on top of that, the newest edition to our family also got a surprise and several new Catholic t-shirts of her very own, including her own LEGO Pope t-shirt with room still left to grow. So major thanks to Dan for his enormous generosity. And if you are a retailer or looking for a cool fundraiser for your youth group, make sure to check out Dan’s fundraising kit where you can get a bunch of the shirts and sell them to support your Church group. It’s a great opportunity and better than a bake sale.